The inspiration for much of my work has come from the experiences, influences and images of my life. This provides the fuel for imagination and fantasy which in turn creates the basic structure and energy of a project for me. When I think back to the early influences of my life, I realize how important each decision I made or situation I have been faced with, has burnt itself into the fabric of who I am today. Of course, this is true for everyone, but there is another aspect to what makes us an individual, and this is our spirit. The realms of positive and negative energy and the subtle combination of these extremes mixed together with the defining moments of one’s life brings us closer to the truth. Born and raised in the North of England, I found myself at 30 years old, very disillusioned with my “environment”, a crossroads, if you will, and a chance to re-discover myself and life outside the goldfish bowl I had been brought up in. I left England with a backpack, tent and a one-way ticket to Bangkok. Within 3 days I had landed in Haadrin, a small settlement at the tip of an island called Koh Phangan, off Thailand’s south coast. It was 1991 and I found a kind of paradise, a couple of hundred travellers from all over the world, celebrating life on those idyllic beaches. Dancing all night in the sand to a new kind of electronic music, that I had never heard before. This was my introduction to Goa-Trance music and blacklight art. Preparation for these parties was extremely ritualistic, using (like the hippies from the Sixties) lots of fluorescent paint, full of tribal images and figures like Shiva, Ganesh and other deities from Hinduism as well as various other symbolic images held sacred by many indigenous peoples. With fluorescent paints it was as if the artists were painting with light itself, and the creative potential that using such colours had, blew me away. During this time I got to hear many travellers’ tales of the beautiful, strange and exotic mosaic that our world really is. For the first time in my life I felt free and truly inspired to meet such wonderful people from every corner of our planet. I realized that my life was changing, I felt full of purpose and energy as I began a voyage of discovery. My travels took me around much of South Asia and South America before landing in San Francisco in the summer of 1995. Whilst there, I learned of the local art from the psychedelic 60’s era and how it’s influence resonates around the globe as much today as ever. Just to be in San Francisco was inspiring, and I painted frequently as the ideas flowed through me. It was 3 years later in 1998 that I met my soulmate Moni on a return trip to San Francisco after some time in India and Nepal. For sure, Moni was the catalyst I needed to focus on painting, and we flew back to Germany together as she had to complete her degree at university. So at last, I had the opportunity, after all the years of absorbing, to dig deep into myself and begin to express the experiences and emotions that I had acquired in an artistic way. 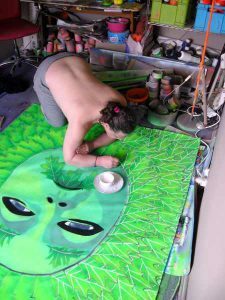 I began to paint backdrops for decoration at festivals and clubs all over Europe. This allowed me time to be introspective and I soon found myself painting between 8 and 10 hours almost every day. Since 1999 I have devoted myself to my art, making mistakes along the way, I have taught myself by trial and error, experimenting with a lot of ideas. I use acrylic paint, mixing fluorescent, metallic and regular colours to get the visual effect I am looking for. I apply the paint with paint gun, airbrush and paintbrush using handmade stencils and freehand techniques. The process for me begins with the concept, a feeling, emotion or idea, usually just before sleeping or during REM sleep, this is the seed for a painting project. 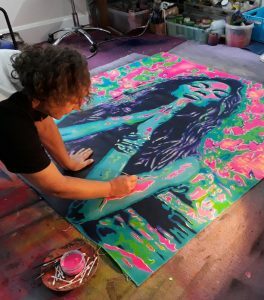 What I then try to do is somehow bring individual life into each piece, to give the painting its own energy whether it be spiritual, meditational, sexual, calming, or merely thought provoking in an attempt to stir emotion, conversation and ideas in other people. The objective therefore is to bring positive energy and optimism to my work and then share it with others. In 2008 we returned to England where I believe my work has gone from strength to strength as I learn from the mistakes I have made previously. It has been a time of love, happiness, peace and good friends, allowing my creative self to flourish. We are living in historical times and I feel more than ever that we need to focus on positive energy and share it in whichever way we are able. Modern art in Europe so often is filled with dark and bleak images, mechanized and tormented visions that leave me deflated and somehow tainted by its negativity. I consciously try to work at the other end of the spectrum. After all, art is only a reflection of life as the artist sees it, and I want to celebrate life. It is the attitude we have to ourselves and our environment today, which creates and shapes the future. Energy and time are our two most valuable possessions. Often maturity comes from conditioning by past experiences and my true goal is to go beyond conditioning, as we are not bundles of programmed reflexes and nerves, constantly being triggered by people and circumstances into predictable outcomes ……… we have choices. The more consciously we make choices in the direction of creating joy and fulfilment for ourselves and those around us, the more life is filled with positive energy. 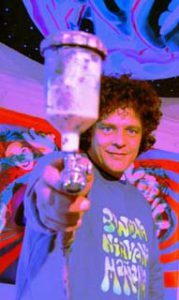 I hope that you enjoy my humble efforts, please e-mail me your thoughts and comments at robbie@psychedelic-art.com. Whirly Fayre 2017, Copyright Michael Stuart Neale – Facebook. Whirly Fayre 2016, Copyright, Denzimages – Facebook.